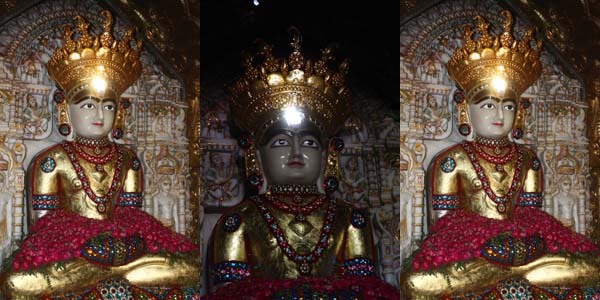 'Surya Tilak' is a unique event in which sun rays appear on the forehead of Mahavir Swami, at KOBA Jain Temple exactly at 2.07 pm on every 22nd of May. ‘Surya Tilak’ continues for Seven minutes. The large numbers of devotees remain present at this tirth to witness this event every year. On May 22, Acharya Shree Kailashsagar Suriswarji had spent their last moment in Koba Mahavir Jain Aradhana Kendra. Since then Acharya Shree Padmasagar Suriswarji pioneered to worship Lord Mahavir by Surya Tilak. There is no magic, but such Surya Tilak has been made possible with the perfect use of Mathematics, Astronomy and traditional knowledge of sculpture. This unbelievable and effective calculations which has created "SURYA TILAK" at every year has calculated by Ganivarya Shree Arvindsagarji Maharaj Saheb. The similar mathematics and calculations being done by Ganivarya Shree at "Shri Simandharswami Pratyaksh Panchang" since last 32 years.